There is an overwhelming amount of horse Stuff out there. Every week there is some new tack gadget, miracle feed, or how to training video added to the horse world. Where does one start, because most of them aren’t cheap. The plan with this page is to try and sort some of it out. The older I get, the more advertising really bugs me! It seems that I have less patience for the schemes of big business and there bigger, better and never been done before tactics! Having seen trends, fashions, and the latest and greatest come and go in the equine world, it just wears me out. One of the main questions I am often asked is “What bit should I use?” I address some of the problems of using the wrong bit, or using the right bit the wrong way in head bobbing horses , so I won’t spend a lot of time here with it. I always tell people to remember that any bit can be severe, from a simple ring snaffle, to a silvered Spanish spade. It all comes back to us. Is your saddle handmade or bench made or name brand? Does it matter? What about your style – If you go to your local tack store or look in the tack supply magazines, your eyes can get wore out pretty quick. Well maybe we can sort them out a little. 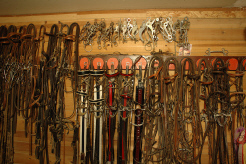 For questions about horse tack and supply, please contact us.